After a long and, what I initially perceived as, cold winter, I had a break before next semester. 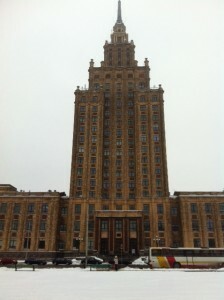 I decided to go to Riga in Latvia for a quick holiday. I was soon to discover a whole new meaning for the word cold. With a blistering – 20 degrees, all my previous experiences with “cold weather” in Sweden seemed ridiculous. After coming home to my warm – 3 degrees, I decided to be more thankful for what I got! It might be dark, boring and a bit cold here in Sweden, but it is NOT – 20 degres!